As winter approaches and kids anticipate shooting hoops and hustling on the courts, we’re reminded that the sport of basketball was invented by a YMCA institution – nearby in Springfield, MA. Moreover, the game’s first professional team came from a YMCA. Locally, the Hockomock Area YMCA is currently enrolling youth for an active winter of basketball and cheerleading leagues. 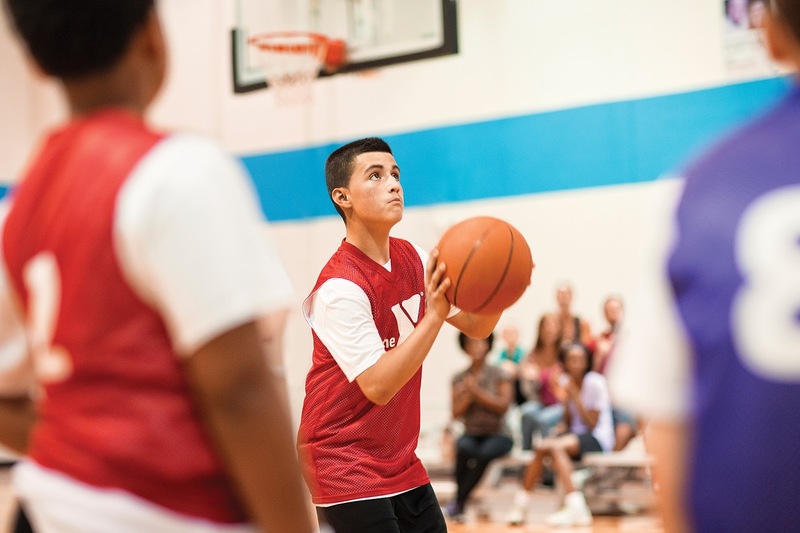 Millions of people have been introduced to sports at the Y, and whether your child is just starting, new to team sports, or a regular on the courts, YMCA Sports are worth checking out. Practices are developed to meet the needs of each group. The first 3 weeks are devoted to practice and the last 5 weeks to games. Runs for 1 hour, Saturdays @ The Foxboro Y: 4 YRS 10:00am; 5–6 YRS 11:15am, 12:30pm, 3:00pm; 7–8 YRS 1:45pm, 3:00pm. @ The Franklin Y: 3–4 YRS 10:15am; 5–6 YRS 11:30am; 7–8 YRS 12:45pm. And @ The North Attleboro Y: 4 YRS 10:00am; 5–6 YRS 11:00am; 7–8 YRS 12:00pm. League play for youth ages 9-11 includes the option of signing up on a weekly basis if you cannot commit to all eight weeks. Runs for 1 hour, Saturdays @ The Franklin Y 1:45pm and @ The North Attleboro Y 1:00pm; runs Fridays @ The Foxboro Y 6:00pm. Also offered for 3 year olds, Youth Basketball Prep. In this class setting, children will learn skills related to dribbling, passing, shooting, and defense. Includes games designed for that age group based on cognitive and social ability. Runs Saturdays in Foxboro and North Attleboro, 9:00-9:45am. Learn fun routines and enjoy being part of a team. Girls will cheer at basketball games during the second half of YMCA leagues season. Beginning level, includes jumps and tumbling. Saturdays @ The North Attleboro YMCA 11:00am-12:00pm. Also offered for younger girls, ages 4-5, at the same location is Cheerleading Prep. This program runs Saturdays 10:00-10:45am. Team shirt and end of season award will be given to season participants. Cost is as follows. Youth Basketball League: $42 (family-type member), $84 (youth member), $126 (program member) - or – weekly drop in rate (ages 9-11): $11/day (member), $17/day (program member). Cheerleading cost: $57 (family-type member), $114 (youth member), $171 (program member) includes uniform. Prep classes cost: $71 (member), $107 (program member). For more information, visit hockymca.org/winter-leagues. See you at the Y! About Hockomock Area YMCA: Where Cause Meets Community. At the Hockomock Area YMCA, strengthening community is our cause. The Hockomock Area YMCA is an organization of men, women, and children sharing a commitment to nurture the potential of kids, promote healthy living, and foster a sense of social responsibility. Our YMCA is committed to partnering and collaborating with others to create and deliver lasting personal and social change in the 15 communities we are privileged to serve. The Hockomock Area YMCA is a not-for-profit charitable cause-driven organization with facilities in North Attleboro, Foxboro, Franklin, and Mansfield. For more information visit hockymca.org.